Chances are, you don't need an excuse to enjoy a filling peanut butter and honey sandwich, but it's still good to know that this favorite is packed with nutritional benefits. Beginning with fiber and complete protein, and including a variety of heart-healthy fats and vitamin E, a peanut butter sandwich is a nutrient-dense choice. Even if you're on a low-calorie diet, you can still accommodate the calories from one peanut butter and honey sandwich in your meal plan. Whether you prefer smooth or chunky peanut butter, the calories stay the same: Two tablespoons of peanut butter contain 188 calories. It's a good source of protein and contains some carbs, including fiber and sugar. These two macronutrients account for about one-third of the total calories. The largest percentage of calories comes from 16 grams of total fat. The fat content, which provides 144 calories, is high enough to justify limiting serving sizes, but don't let it stop you from eating peanut butter. It's packed with healthy unsaturated fats that help lower your cholesterol. Honey is often viewed as a healthier alternative to jam, but the two are almost identical when it comes to calories and nutrients. The amount of honey or jam you'll use on a peanut butter sandwich is so small that neither one contains any measurable nutrients. One teaspoon of honey has 21 calories, which come entirely from sugar. The same portion of jam has 18 calories. Both sweeteners are free of fat and sodium. Whole-wheat bread and processed white bread contain about the same number of calories. Two slices of whole-wheat bread have 161 calories, while two slices of white bread contain 132 calories. Whole-wheat bread is well worth the additional 29 calories because it supplies three times more fiber. Most Americans consume only half of their recommended daily intake of fiber, which is bad news because it helps prevent cardiovascular disease, according to the American Dietetic Association. 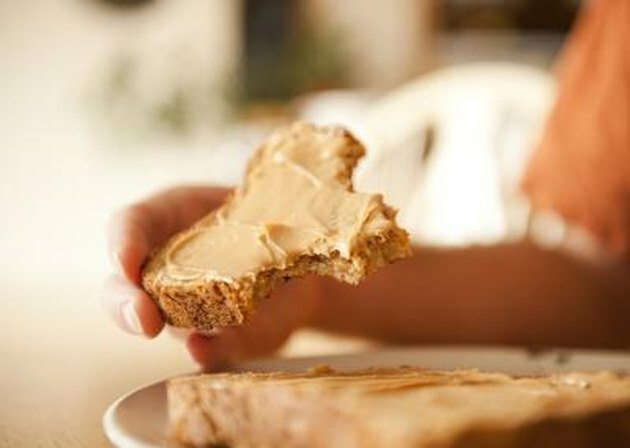 Your choice of bread for a peanut butter and honey sandwich is a good opportunity to boost your fiber intake. One sandwich made from 2 tablespoons of peanut butter, 1 teaspoon of honey and two slices of whole-wheat bread contains 370 calories. Watch out for extra oil, sugar and other sweeteners added to some brands of peanut butter because they'll add to the total calories. Also be on the lookout for sodium. The amount of sodium in most types of bread is about the same because some salt is used during baking. Peanut butter is another story. Peanuts are naturally low in sodium, but the amount in 2 tablespoons of peanut butter may range from 5 to 156 milligrams or more, depending on how much was added during processing. Is Honey Nutritionally Better Than Sugar? Can You Eat Too Much Popcorn? Which Is Better for Your Health: Wheat Wraps or Wheat Bread?